Advocacy Updates Archives - FedUp! On Dec. 17th and 18th, a joint FDA Advisory Committee met to discuss accessibility of naloxone, the opioid-overdose antidote. Following a Call To Action posted by the FED UP! Coalition several weeks ago, hundreds of comments had been submitted to the docket for the Advisory Committee’s review prior to the meeting. Representatives and staff of the FED UP! Coalition attended the hearing and met with industry, advisory committee members and other harm reduction activists. Much of the Advisory Committee discussion revolved around how naloxone could best be distributed to those who need it. This discussion involved such issues as the need for a Federal Government response that will assure a “stable and affordable supply of many millions of doses” “procured by the federal government” for [distribution through] various channels. Emphasis was placed by many of the Committee members on the need to support community-based distribution programs. Barriers to naloxone access include the cost of naloxone, state naloxone accessibility laws, lack of generic alternatives for the intranasal and auto-injector forms of naloxone, lack of over-the-counter naloxone. Most emphasis regarding the outcome of the Committee meeting has been on the vote on FDA labeling language regarding co-prescribing. This is because the only question on which the Committee was asked to vote was the following: “Would labeling language that recommends co-prescription of naloxone for all or some patients prescribed opioids, or more targeted prescribing for patients otherwise at high risk for death from opioid overdose be an effective method for expanding access to naloxone and improving public health?” Those situations in which the FDA would recommend co-prescribing were not specified. Co-prescribing of naloxone means that for all or some patients naloxone would be prescribed along with their prescription for opioids. The major purpose of co-prescribing is to place naloxone in the hands of those patients at greater risk for an opioid overdose. An additional major benefit to co-prescribing is the conversation between the physician and patient. This dialogue provides an opportunity to educate patients in how to recognize and reverse an opioid overdose and extends a gateway for other conversations regarding opioid use disorder and other risks of opioids. Some of the concerns with naloxone co-prescribing include the cost, effectiveness of the model, and stock of the medication. A major concern regarding the effectiveness of the co-prescribing model is that the majority of opioid overdoses are now due to illicit fentanyl, and co-prescribing will not properly target the group of people who use illicit opioids. The Committee ultimately voted 12-11 in favor of the single question the FDA had asked it to vote on. 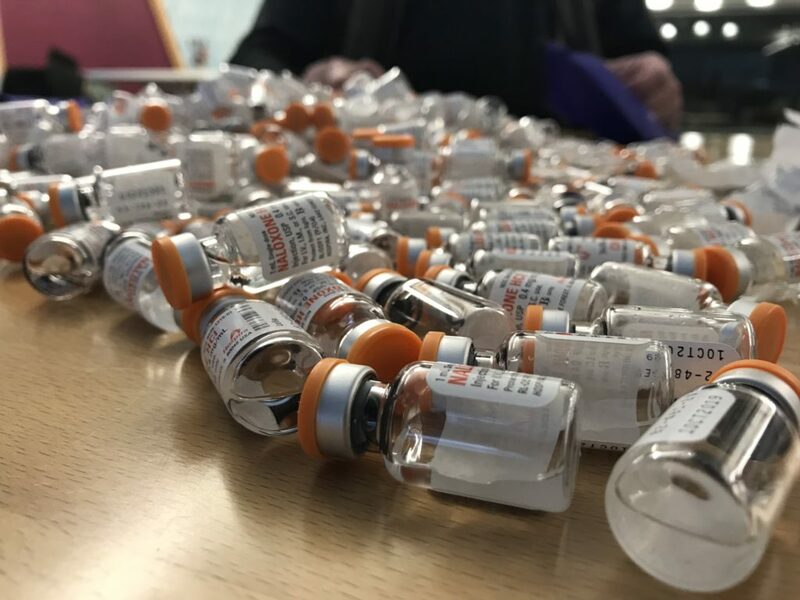 Vials of naloxone being packaged in overdose prevention rescue kits by the Steve Rummler HOPENetwork, member of the FED UP! Coalition and an organization which operates a community-based overdose prevention program in Minnesota. However, the comments of the Committee members regarding their votes show that many of them saw co-prescribing as less important in the overall public health effort than assuring measures such as inexpensive over-the-counter availability of naloxone and assuring an adequate supply of naloxone to community-based distribution networks. It should also be noted that for a prescription medication to become an over-the-counter product, a manufacturer must submit a consumer-friendly drug facts label (DFL) and proper study which illustrates the medication is easily administered or taken without the assistance of a medical professional. The FDA has developed a model DFL and now waits for a manufacturer to submit an OTC naloxone product for review. This is the first time the FDA has proactively developed a model DFL. FDA representatives at the December meeting mentioned there has been great interest among manufacturer and once something is formally submitted it will be fast-tracked to become an OTC product. The concern still lies with insurers covering an OTC product, indicating an OTC framework is not a panacea to increasing accessibility of naloxone. The Federal government to subsidize over the counter naloxone to keep the price under $20 per dose. Have been prescribed benzodiazepines (regardless of opioid dose). Have a non-opioid substance use disorder, report excessive alcohol use, or have a mental health disorder (regardless of opioid dose). Using heroin, illicit synthetic opioids or misusing prescription opioids. Using other illicit drugs such as stimulants, including methamphetamine and cocaine, which could potentially be contaminated with illicit synthetic opioids like fentanyl. Receiving treatment for opioid use disorder, including medication-assisted treatment with methadone, buprenorphine, or naltrexone. This entry was posted in Advocacy Updates and tagged FDA, harmreduction, naloxone, Narcan on December 29, 2018 by FedUp Rally. One year ago, President Trump declared the opioid crisis a public health emergency. On Wednesday, the opioid package was signed into law with $8.5 billion allocated for opioid solutions. This will provide critical funding to the states to combat the growing opioid crisis across America. Key components of the bill include funding for addiction treatment, recovery housing and job training for people with substance use disorder and a lift on an outdated rule which barred Medicaid from covering addiction treatment in facilities with more than 16 beds. Expanding access to medication assisted treatment is another function of the bill, widening the scope of prescribing for non-physician prescribers. With fentanyl now the leading cause of opioid overdoses in our country, measures to tighten postage tracking will also be implemented. The bill allocates the money over the next year. 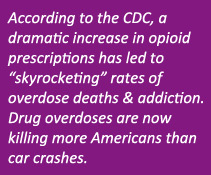 Although the bill is an excellent step in the right direction and an example of bipartisan cooperation to address the crisis, until addiction is treated as a disease by society and truly confronted as a public health emergency, we will continue to see an influx of overdose deaths and the number of individuals suffering from the disease of addiction. Fighting systemic injustices is critical. Insurers upholding parity, coverage of addiction treatment, standards of care for recovery residences, compassion and care towards those who use opioids to manage pain, reducing addiction stigma; all are essential changes we need. The funds are simply not enough. Hundreds of billions are needed over multiple years. A proposal by Sen. Warren and Sen. Cummings would have done just that. Modeled after the Ryan White CARE Act, legislation that funded solutions and support for communities impacted by HIV/AIDS, the Warren-Cummings proposal called for $100 billion over 10 years. This proposal was not included in the final opioid bill. With more attention to treatment for opioid use disorder, it’s important for us to also advocate for recovery services. Recovery for the individual and the family. These funds would never have been made available without you. You called, emailed, showed up, and told your stories. We, as a coalition, work together as individuals and organizations to advocate for these changes, to save lives, to deliver compassion to our communities. Only together are we a powerful constituency, a unified message, a coalition. We have a lot of work ahead of us. Today, the Ensuring Patient Access and Drug Enforcement Act still stands, the FDA continues to approve new, highly potent opioids, and overdose deaths continue to soar. We will continue to demand Federal action, to rally in cities across the country, and raise our voices. We’ll push forward in our local communities with the work of our organizations and the advocacy of the individuals demanding change. This entry was posted in Advocacy Updates on October 26, 2018 by FedUp Rally. Arsonist Awarded Patent for Fire Extinguisher! Shocking? So is this recent news …..
Richard Sackler, the former Chairman and President of Purdue Pharma, and Rhodes Pharmaceutical (a subsidiary of Purdue Pharma) have been awarded a patent for treatment of opioid use disorder, the disorder the Sackler family and Purdue Pharma knowingly fueled along with overdose, death and family tragedy. At a minimum the patent should serve the public good and provide no economic benefit to the Sackler Family. “Chronic pain, which may be due to idiopathic reasons, cancer or other diseases such as rheumatism and arthritis, is typically treated with strong opioids. Outrageous, dishonest and lacking any acknowledgement of responsibility for fueling the opioid epidemic thru deceptive marketing and promotion of Sackler products. FDA approval of a product made through this patent and a company (Rhodes) set up to obscure the Sackler connection would allow the Sackler family to reap more profits from a treatment for the epidemic caused by Sackler family products. Sign up for our mailing list today and we’ll let you know how you can help as plans are formulated to make sure that the Sacklers never profit from this new patent. This entry was posted in Advocacy Updates on October 3, 2018 by FedUp Rally. Addiction Policy Forum (APF) and its Founder, CEO, and President, Jessica Nickel, have become a force within the addiction advocacy movement. Ms. Nickel is widely respected. She is bright, capable, and gets things done. In the past year, she has testified before the President’s Opioid Commission and before important congressional committees and subcommittees. The problem is the relationship between Ms. Nickel and the pharmaceutical industry. This entry was posted in Advocacy Updates on July 6, 2018 by FedUp Rally. The long delay since the last Advocacy Update does not reflect the pace of activities in the opioid addiction epidemic or in FED UP! The terrible news that came in December was a shocking 27.7% increase in opioid overdose deaths. 350,000 Americans have now died of opioid overdose deaths since the epidemic began in 1999. Between 2015 and 2016, deaths due to fentanyl and analogues more than doubled from 9,945 to 20,145, and more opioid deaths in 2016 involved fentanyl than either prescription opioids or heroin. Fentanyl is 50-100 times stronger than heroin, and users have no way to know how much fentanyl has been added to their heroin, or whether their entire heroin dose is in fact fentanyl. Heroin has always been a dangerous drug, but as fentanyl-laced heroin became common, the death rate for heroin users tripled. This entry was posted in Advocacy Updates on April 21, 2018 by FedUp Rally. The last few months have certainly demonstrated the real inadequacy of the Federal Government’s efforts in dealing with the epidemic of opioid addiction. The worst news has been the ongoing escalation in opioid overdose deaths. 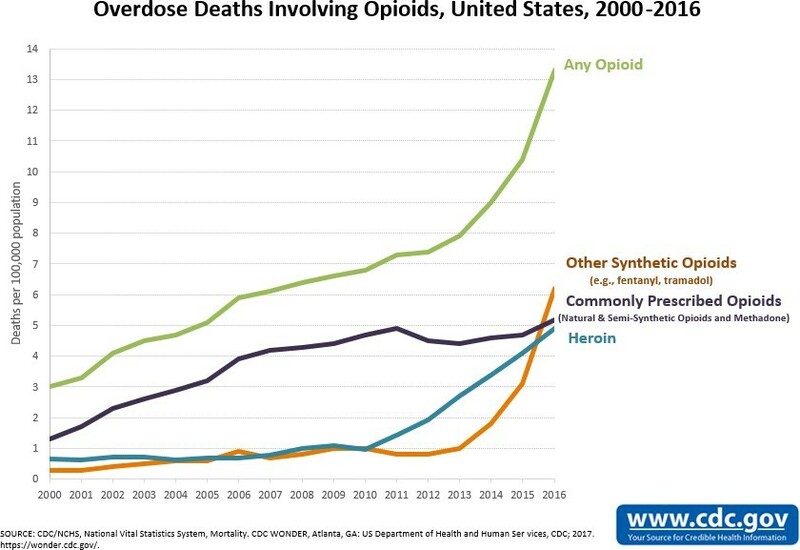 Furthermore, provisional CDC data indicate that there has been a rise of another 8.1% of opioid deaths in 2017, which would bring the number of opioid deaths to 69,000 in 2017. This entry was posted in Advocacy Updates on March 23, 2018 by FedUp Rally. Our August FED UP Rally included a press event at the National Press Club calling for FDA removal of high dose opioids, a networking luncheon for partners to share advocacy practices, and a march to the White House and a candlelight vigil for hundreds of our followers. We believe our voices are being heard and reflected in a number of important addiction-fighting developments this fall. This entry was posted in Advocacy Updates on October 29, 2017 by FedUp Rally. Since our last update and in the face of ever increasing overdose deaths, we have seen coverage of the opioid addiction epidemic increase nationally. The epidemic has generated additional interest in policy and legislative solutions as well. This entry was posted in Advocacy Updates on August 1, 2017 by FedUp Rally. The FED UP Coalition is saddened to report that opioid-related overdose deaths continue to rise, seemingly unabated. Nationally, opioid overdose deaths rose 15% from 28,647 in 2014 to 33,091 in 2015. Heroin overdose deaths are skyrocketing because fentanyl is frequently mixed in with the heroin or sold as heroin. Final 2016 statistics, when reviewed and released by the CDC, are expected to be even more horrific. This entry was posted in Advocacy Updates on June 1, 2017 by FedUp Rally.